Galerie F will once again have a booth at C2E2 in Chicago, IL this weekend where they’ll be releasing a number of awesome convention exclusive prints, including two beautiful matching Star Wars posters by Justin Van Genderen! 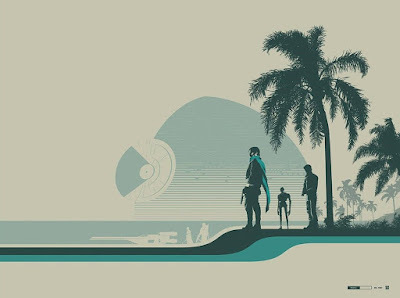 Along with a poster for The Force Awakens, Justin also designed this Rogue One print entitled “Jyn Erso (Scarif)”, which features Jyn Erso, Cassian Andor, K-2SO, Chirrut Îmwe and Baze Malbus on the beaches of Scarif with the Death Star behind them in the sky. The C2E2 2017 Exclusive “Jyn Erso (Scarif)” by Justin Van Genderen is a 24”x18” Star Wars: Rogue One 3 color signed and numbered screen print limited to just 100 pieces. Any remaining posters will be made available online at GalerieF.com on Monday, April 24th, at 2pm CST.